When people hear "Reformed", what pops into their head is "TULIP"...well, a lot of times what pops in it "predestination" and that can end the conversation right there. And it is true that when I first started looking at Reformed theology, TULIP is the first thing that I found and the first thing I looked at. Who can argue with the "total depravity of man"? But just beyond "TULIP" are the Solas. The Solas are the "love of my Reformed life". They have become much more central to my "state of being" than TULIP ever was. Soli Deo Gloria...for the Glory of God alone. The God that I belong to is so great, so vast, so everything that is...is there anything or anybody else that deserves glory? Is there anything that tries to get into the limelight of glory? It is this understanding of the Glory and centrality of God that should drive all other theology. When looking at a theology, ask: does it glorify God, or does it glorify man, or does it glorify creation? Solus Christus...Christ alone. It is only through Christ - and Christ on the cross - that we can be saved. My tattoo is a week old today! I recently took stock of where I am, what I've done and how I've changed and/or grown. And something that might seem out of character underscores the change. 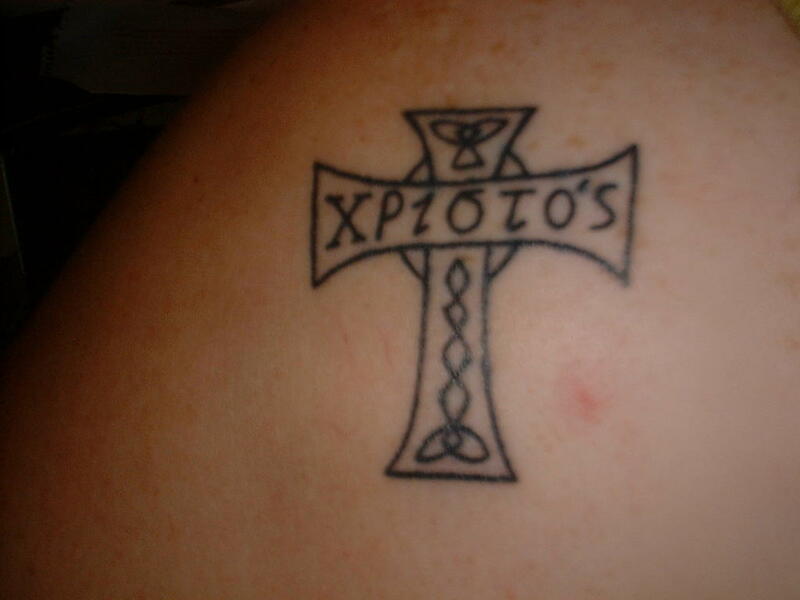 This tattoo is a celtic-style cross, only instead of knot work on the crossbar, there are Greek letters, Christos - Christ on the cross. For me, in my Reformation from Arminianism, Christ alone on the cross means that there is no room there for my works, my filthy rags (righteousness). It's all Christ on there. My son designed it (so it's not exactly professional, but I'll probably end up going back to have it shaded later) and the letters are in Greek because Manda and I are taking a Greek class together. So both my kids are "in" the design. Sola Fide/Sola Gratia...by grace alone, through faith alone. The gift of grace, by the gift of faith. The knowledge that there is nothing that I can do that will make me worth being "saved". There is no despair at not being able to measure up; no pride in the thought that I can do it myself. Sola Scriptura...The authority of Scripture as the only infallible guide of faith and conduct. Not SOLO, but Sola...Scripture is the "rule" (measuring stick) by which all other authoriy is examined and either submitted to or rejected. To me, the "Solas" are the beautiful expression of our attitudes toward God. TULIP is sotierological. How God saves. The Solas are about how God IS. If we look at our teaching and ask, how does this reflect Christ? Does it reflect how we (either as the church or as individuals) relate to the Prince of Peace? Does it point to the glory of Christ? The glory of God? Does it pull the rug of self-righteousness out from under us, leaving us with only Christ on the cross for our salvation? Posted in Christian (Reformed). Tags: Christ On The Cross, Christian (Reformed), Christianity, Reformation, Reformed Theology, Solas, Soli Deo Gloria, tattoo, Tulip on July 27, 2008 by MzEllen.